Many people want to have a Digital SLR camera but are reluctant to buy it because of the size and quite heavy if taken on vacation. When they offered with compact-system cameras, they are also not so pleased. Actually, they can choose mirrorless camera. You also can choose high-class compact camera, but the price is quite expensive. They demand to be able to have a small digital SLR camera with affordable prices and Canon finally answered with the launch of the Canon EOS D100. 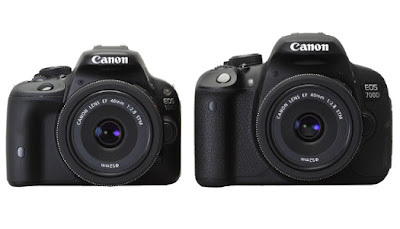 If you are curious, you can compare the size of the Canon EOS 100D with the EOS 700D and the Nikon D3200. 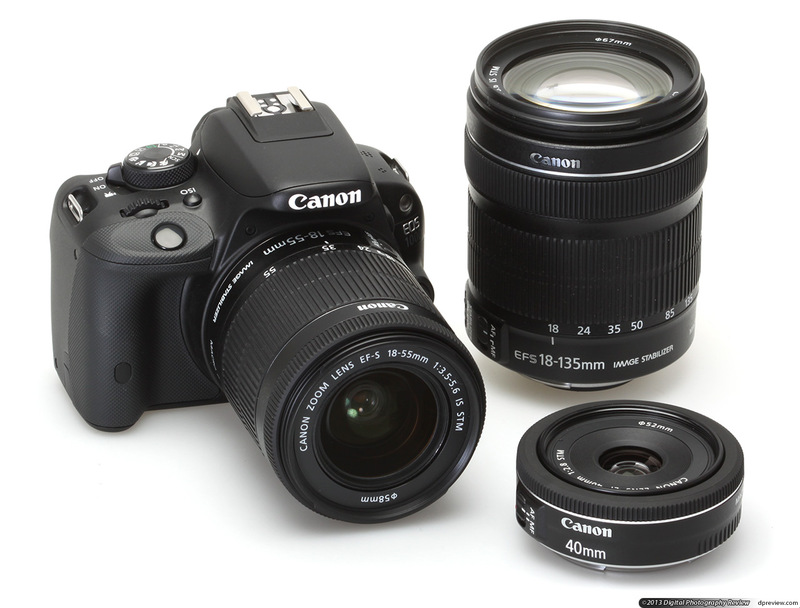 You will know that this time, the Canon EOS 100D Digital SLR camera is the smallest on the market. Canon EOS D100 or referred as Rebel SL1 is 25% smaller and 28% lighter than the Canon EOS 650D, the dimensions 116.8 x 90.7 x 69.4mm and weighs only 407 grams. The camera's LCD screen is also equipped with LCD Capacitive Touch Screen that allows users to easily operate the AF and shutter release with a touch on the touch screen and is very comfortable when you use. Canon EOS D100 seemed to have gone through the process of miniaturization and optimization of products making it named the EOS DSLR camera with the smallest and lightest-in-class design (EOS 100D has the lightest body of all the APS-C DSLR cameras with interchangeable lenses (lens shift). Though the size of this camera is quite small, but the Canon 100D is quite reliable with full ability and in accordance with the expectations of the users of DSLR cameras. The camera is reinforced with 18 Megapixel APS-C CMOS Hybrid AF II combined with the DIGIC 5 processor. 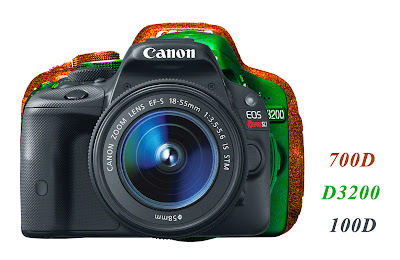 Canon EOS D100 is also capable of recording full-HD video with a frame rate of 30fps, 25fps, or 24fps. Although small, the Canon EOS 100D even features an in-camera editing and cropping function that allows us to modify and polish images but it also includes the following scene modes: Food, Candlelight, Night Portrait, Kids, Handheld Night Scene and HDR Backlight Control. With such a variety of creative features, you can make creative photo according to your artistic aspirations. The features that you need to look, and certainly very interesting for you to use is implementation of the Extra Effect feature shot (in Creative Auto (CA) mode). With this feature you will be taking two images simultaneously when users capture images using filter and without filter. Extra Shot function for backing up and used as a template to apply filters capture images at a later time. Maybe you also will try Miniature effect movie. With this feature the user can set up fast-forward with the speed of 5x, 10x and 20x faster to give the appearance of a miniature model of a fast-moving, but in this mode the sound is not recorded. With these features especially the size of the camera is different with Digital SLR cameras in general, then you should not hesitate to buy a Digital SLR camera. Canon EOS D100 can accompany you on holiday to Bali, Raja Ampat, Africa or to anywhere. If you want to take photos with distant subjects, you can add a superzoom lens for example lens with a range of 18mm - 200mm. You do not need to buy a genuine Canon lens, because you can get sharp images of third-party lenses such as Tamron or Sigma lens.